Sweet Pickle Designs: Top Of The Day To Ya! We have a thing for green in our house. My hubby grew up in Dublin, Ohio. you'll notice I'm not the best blogger. and been fooling around over at Crafty Sisters! I send things out the door faster than I can document them! I'm appreciating learning with my sister the fine art of blogging and promise to do better! Here are a couple of pics sent in lately from 2 talented gals! First up are some lovely letters Jessica R. made up for her sis for Christmas! 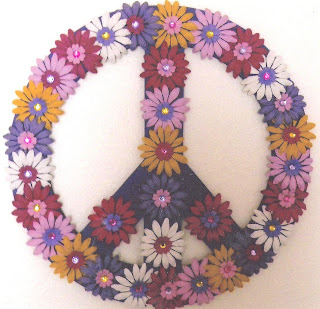 Rita C. decorated this really fun 2 foot tall Peace sign for her daughter! I love seeing what you guys do, so share the love and send in those pictures of your completed projects! 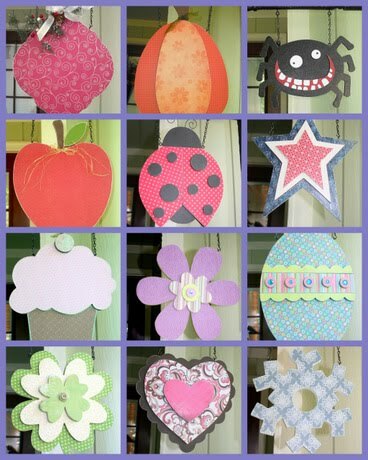 I just came across your blog from Crafty Sisters and wanted to share my latest letters craft. I won't say they are anything like yours. But I think it is just so fun to make them. If you have any advise for me-I would love to hear it. Do you paint them or do you use paper? Thanks for sharing your craft with us in the blogging world.